The Association decided to set up a Bursary in Trevor Henry’s memory. Each year members apply for this Bursary which enable them to travel to England and observe two ECB panel umpires in action and enable the recipient to develop his skills and gain experience from his time with his County colleagues. The cricket fraternity in Ireland has been deeply saddened after the sudden illness and death of International umpire Trevor Henry at the age of 51. Trevor served the game with distinction over many seasons and he quickly established himself as a highly respected senior umpire. Early recognition came in June 1993 in his and North Down’s first international when Ireland hosted Barbados at the Green, Comber. 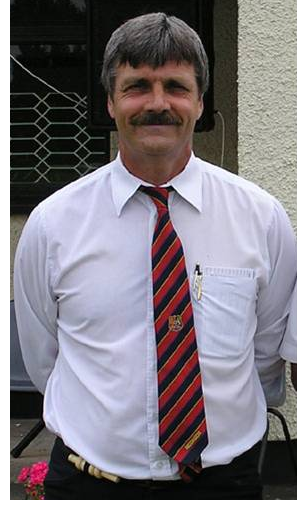 Since his International umpiring debut in 1993, Trevor umpired a further 36 International matches, as well as Cheltenham & Gloucester and County Second XI fixtures. Following the recent umpiring development programme established by the ICC, Trevor’s talents had been fully recognised and more than half of those international appointments have come in the last two years. Trevor had arrived on the World stage as a member of the elite Associate panel and further International appointments had been assured. His appointments included Ireland’s matches against Australia and the West Indies in addition to seven matches in the ICC Trophy 2005. In the Intercontinental Cup, which has only been running for two years, he had already stood in four matches including three in Toronto last August. He had been nominated for the U19 World Cup in Sri Lanka but had to withdraw after his sudden illness. Trevor umpired throughout the NCU area and stood in three Senior Cup Finals including last season’s final at Downpatrick. In 2005 he also umpired the inaugural Twenty20 Cup final at Comber. In Ireland he also stood in three Senior Cup finals. He constantly strove to set high standards as an umpire and officiated every game with the same degree of professionalism. He was highly respected by all his umpiring colleagues and also by the players who always accepted his decisions. Affectionately known as Trigger, Trevor will be sadly missed at cricket grounds not only throughout Ireland but also further afield. We continue to remember his wife Roberta, children and the entire family circle.